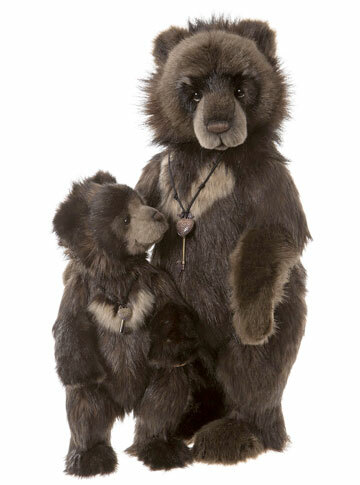 The popular Mother and Cub series now welcomes this papa bear and his cub. Big Ron and Little Ron are the sweetest pairing of grizzly bears standing 16 and 24.5 inches tall. Each is five-way jointed and handmade from ultra-soft plush. Their faces have hand-stitched noses, subtle airbrushing and glass eyes backed with felt disks for an adorable 'love me' looks. They have ultrasuede paws with flat feet for standing while their upper paws feature embroidery, sculpting and airbrushed details. For classic Charlie Bear touches of detail, each wears a skeleton key necklace. Big Ron and Little Ron are part of the 2019 FOLKLORES & FABLES: Charlie Bears Collection. Limited to only 1500 pieces worldwide. Suitable for ages 3 years and up.